The is no mistaking this long-legged crab. Although his triangular shaped body is relatively small, his legs can reach almost 4 inches in length. 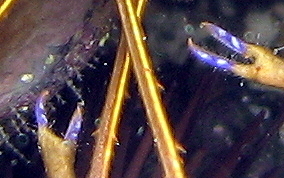 His front knee-caps glow like gold and his claws are an almost iridescent blue. Fairly shy, but one of the few crabs that are out and about during the daylight hours. Using a slow approach you can get quite close. Found in most environments and has been observed in a symbiotic relationship with a Magnificent Feather Duster worm, using the worm as cover protection. 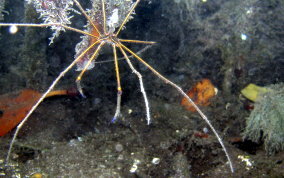 See my YouTube Video of a Yellowline Arrow Crab wooing a Magnificent Feather-duster Worm.